ATLANTA – CNN produced a perfect confluence of journalism and advertising this week. First, Senior Medical Correspondent Elizabeth Cohen told us we were thirty times (or was it just thirty percent?) more likely to die if we ate red meat. The sky was falling! Then, Carl’s Junior ran one of their disgusting commercials. This one featured someone like the old guy on Scrubs if the old guy on Scrubs actually had to wear scrubs. While he was talking about drinking Bourbon all day, this was actually a milestone for Carl’s Junior. The commercial did not feature anyone talking with food in his or her mouth; did not contain any overt misogyny; and did not depict any condiments spattering on clothing or other surfaces. It did however, still contain those unsavory amplified eating sounds. It also featured an enormous hamburger called the Kentucky Bourbon Burger. Yes, eating one of these would lead to immediate death if Elizabeth Cohen had her way. 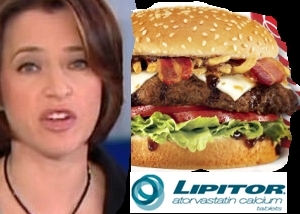 But, just when viewers all began dialing Nine-One-One, a Lipitor commercial came on! So, we were saved before the next segment even aired! Problem solved. Hey, I'm just as shocked as everybody else! 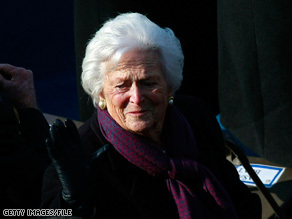 HOUSTON – Former President MORON’s mother underwent surgery for the second time in five months here today. Unlike the November surgery for a perforated ulcer, this one was very unexpected. As it turns, out she had her aortic valve replaced with that of a pig (what, no jackal valves available?). But what makes this event truly unusual is that it proves this person actually has a heart! Astonished doctors confirmed the ice cold organ’s existence to understandably skeptical onlookers. Look Ma, we can be “ethnic” too! Bobby Jindal and Michael Steele are the new faces of the GOP. Sorry, boys, if you want to change the face of your party, it’s going to take more than black and brown folk on the cover to do it. It’s going to take an actual change in your philosophy. This isn’t going to happen as long as you leave Rush Limbaugh as the de facto leader of the party. Even your chairman panders to him. #1 Government assistance and programs != communism. 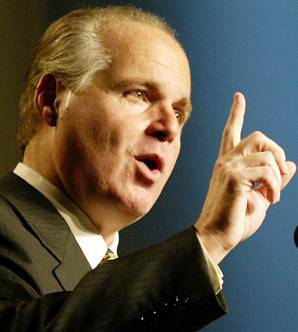 Perhaps Limbaugh is on too many pills to remember things like the patriot act, the suspension of habeas corpus, telling librarians that they must provide lists of books people read, and, oh yeah, the war in Iraq. All of which are abject failures. All of which were instigated by the GOP, because they pushed the fear of terrorism in the faces of the American people 24/7. And what answers would the GOP give? Hello? Anybody there? Is this thing on? And for that, we have to give up our liberties and bow down to atrocities of the human condition, such as the patriot act?! Granted, they’ve thrown Bush overboard. They didn’t even let him go to the convention before the election, and with good reason: he destroyed the party by shredding the constitution, torturing, lying, pandering, and invading. What makes any of us think that if the GOP grabs power again they won’t do the same thing? I hope it will be a good long time before this country trusts Republicans again, and that they will have learned some lessons by then.